Tickets may be purchased in person at West Center Box Office, 1111 GVR Drive in Green Valley or by calling (520) 625-0288. GVRLive! 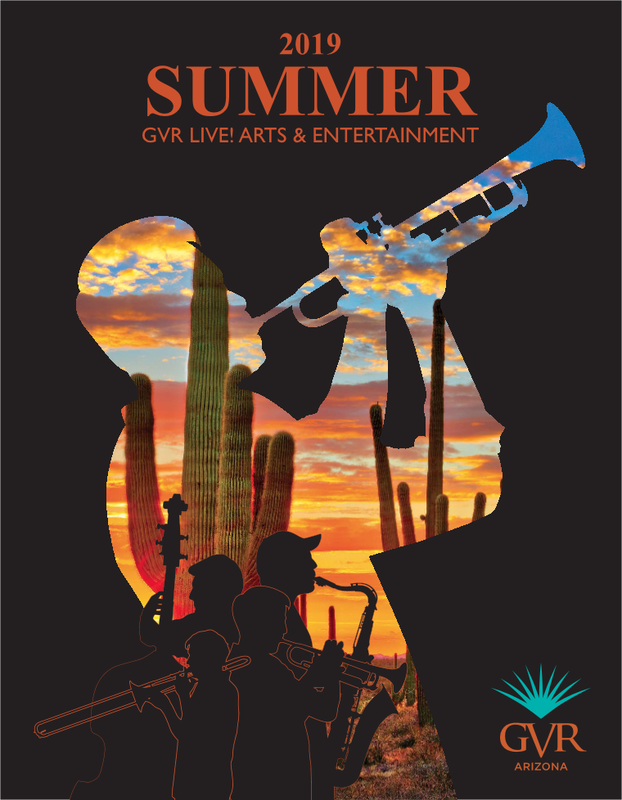 Presents a Summer Season with The Tucson Symphony Orchestra Brass Quintet. Join us to commemorate Memorial Day with the combined talents of Tucson Symphony Orchestra musicians playing patriotic and American music. Comprised of an ensemble of trumpet, trombone, horn and tuba, this performance will leave you feeling the American spirit. 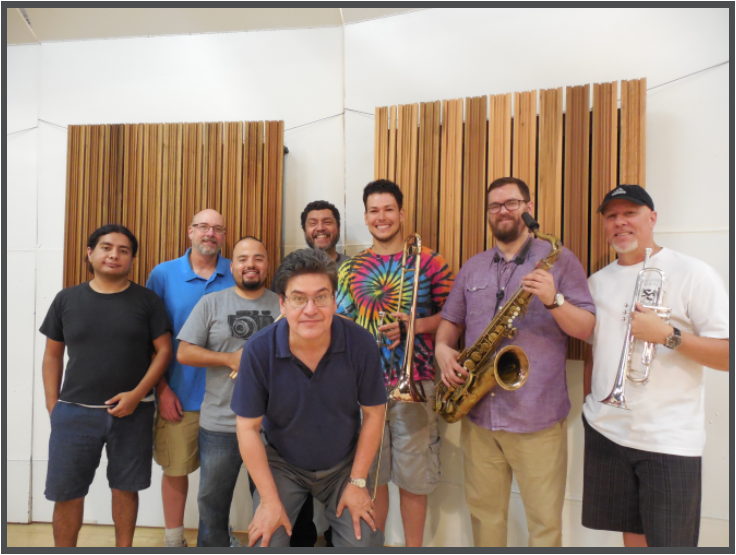 Tucson Latin Jazz Nonet was founded by Homero Cerón and Amilcar Guevara in 2014 and began as an informal “rehearsal” band which grew into something so much more. The Nonet plays Afro-Cuban music with a few Puerto Rican and Southeastern Mexican-influenced numbers thrown in. Their music also includes improvised solos incorporated throughout their performances. This group truly enjoys sharing their love of each of these unique musical styles with audiences everywhere. Come celebrate us Independence day with The Green Valley Summer Big Band! This group is comprised of members from Green Valley Stage Band, Big Band Sounds and other local and regional ensembles. These dedicated jazz musicians, many of whom have had vast experience performing all over the United States, will provide a program of exciting big band arrangements. 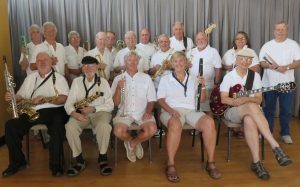 The band is led by Richard Blickenstaff, who has been a fixture in the Tucson jazz scene for several decades. This is a free concert with a limit of two tickets per person. Come join the Jukebox Junqies Band this summer! 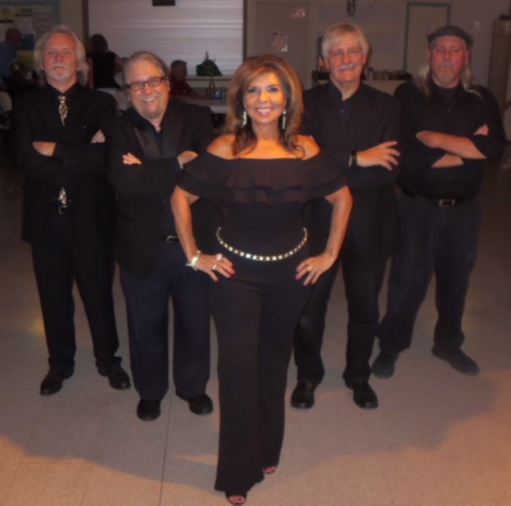 They are a variety dance band that will get you moving to timeless songs of the past, including: Land of a Thousand Dances, Runaround Sue, What’d I Say, Devil with the Blue Dress, Shout, Good Lovin’, and many, many more! 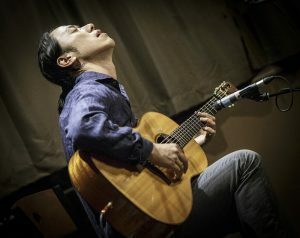 Hiroya Tsukamoto is an innovative guitarist and composer who fuses folk, jazz, and world music. Born and raised in Japan, in 2000 he received a scholarship to Berklee College of Music and came to the U.S. “In terms of musicianship, Tsukamoto’s guitar work was just ridiculous. Right from the beginning of his first song, it was obvious that the folks in Bernunzio’s were in for a treat. His brand of finger style guitar is so intricate, and so blazingly fast at the same time, I kept imagining how many clones I would need to make of myself to accurately replicate his sound. One song that drove that point home was his set opener, “From Coast to Coast,” a song that had some of the fastest harmonic runs I’ve heard”, wrote Trevor Lewis of the Rochester City News. Tsukamoto headlines concerts throughout the U.S., as well as internationally, including Blue Note in NYC and Japanese National Television. Most recently, Hiroya won 2nd place in the International Finger Style Guitar Championship in 2018. Tickets may be purchased in person at West Center Box Office, 1111 GVR Drive in Green Valley or by calling (520) 625-0288. Tickets ordered by phone are held at the box office for pick up on the night of the performance or during regular box office hours. Tickets are not mailed to patrons. Online ticket sales are not available at this time. To purchase tickets please visit the West Center Box Office or call (520) 625-3440. Box office hours are Monday-Friday 8 am-4 pm, weekends and holidays from 10 am-2 pm, and one hour prior to performances and events. Individual tickets for the Summer Performing Arts Season on sale April 1. Individual tickets for the Fall/Winter Performing Arts Season on sale September 1. GVR members may purchase tickets in their name only at the member price, and may purchase up to four (4) guest tickets at the guest price. Members with more than four guests must purchase additional tickets at the general public price. Some restrictions apply. All ticket sales are final. There are no refunds or exchanges for individual member, guest or general public tickets. In the event that a performance is cancelled, refunds may be given. Every effort will be made to reschedule a performance that has been cancelled. Group discounts are available for groups of ten (10) or more by calling the Senior Arts & Entertainment Supervisor at (520) 625-3440 ext. 7219. Student discounts also are available for all performances. Students may be required to present a student ID when tickets are picked up at the West Center Box Office. Please indicate your student status when purchasing tickets at the Box Office. Season tickets may be purchased July 1-August 24, 2018. Season ticket holders have first priority in purchasing tickets to all of the great GVR Live! performances before they are sold out. Season ticket orders can be placed by mail, fax or phone, and tickets will be available for pick up at the West Center Box Office beginning Monday, October 8, 2018. Become a season ticket holder for the GVR Live! 2018/2019 Performing Arts Season to receive a great discount with exceptional benefits. Purchase five (5) or more tickets per person and receive a 10 percent discount off the regular member price for Section A seating, or 15 percent discount off the regular member price for Section B seating. All tickets purchased must be in the same section to qualify for season ticket discount. Season ticket prices are available from July 1-August, 24, 2018. Season ticket holders who purchase tickets to additional performances, special events and dances during the season receive $2 off the regular member price. This discount is not available for the purchase of guest or general public tickets. Season ticket holders receive a 50 percent discount on all concession purchases at all GVR Live! performances and events. Concessions discounts are not available at summer performances or the free movie series. Season ticket holders receive ticket exchange privileges up to 24 hours prior to an event. Season tickets may be exchanged for another performance in the same performing arts season. Season tickets may not be exchanged for guest or general public tickets or special events. Tickets must be presented to process an exchange. Upgrade fees may apply and must be paid at the time of the exchange. Refunds will not be issued if exchanging ticket(s) for a less expensive performance. See Ticket Refund/Exchange section for additional information. Season ticket holders are entitled to ticket exchange privileges. (Exchange policy does not apply to summer performances). Season ticket exchanges are allowed up to 24 hours prior to an event. Season tickets may be exchanged for any other performance in the current performing arts series. Season tickets may not be exchanged for guest or general public tickets or special events. Tickets must be present in order to process an exchange. Upgrade fees may apply and must be paid at the time of the exchange. Refunds will not be given if exchanging ticket(s) for a less expensive performance. Include your name, GVR member number, if applicable, contact information and your tickets, and indicate for which performance you wish to exchange your tickets. All GVR Live! events are held at Green Valley Recreation’s West Center Auditorium, located at 1111 GVR Drive, near the intersection of Continental Rd. and La Canada in Green Valley. Doors open approximately one (1) hour prior to the performance or as indicated on the ticket. Every effort will be made to begin all performances on time. Latecomers will be seated at the discretion of the house manager. Late seating may be unavailable at the discretion of the performing artist. Patrons are asked to arrive at least 15 minutes prior to the performance start time to ensure entrance and seating. Artists, dates, times and programs are subject to change without advance notice due to unforeseen circumstances. The use of still, video and audio recording devices of any kind is strictly prohibited. Kindly silence your phones and electronic devices prior to entering the auditorium as a courtesy to performers and guests. Cinema booster seats are available for children 6 years and older to provide a better view. A cinema seat may be requested by contacting the house manager. Children under six (6) years are not permitted to attend performances. Exceptions may apply for some special engagements. GVR reserves the right to alter seating configurations to accommodate house size. The West Center, including the auditorium and parking lot, are ADA accessible. ADA designated parking is available in the north and west parking lots. GVR makes all reasonable accommodations for those with special needs, including those with service animals as defined by the Americans with Disabilities Act, with advance notice. Please inform the Box Office when you purchase tickets if wheelchair accessible and companion seating is required. The House Manager will identify patrons with accessibility needs prior to opening the auditorium doors for seating. Patrons who have accessibility needs will be seated with the assistance of the House Manager and volunteer ushers. Mobility devices must be removed from fire lanes and aisles. The House Manager will gladly assist patrons with accessibility needs. West Center Auditorium is equipped with two Assisted Listening Systems, the Ampetronic Induction Loop System (known as the Induction Loop) and the Williams Hearing Assist System. Receivers and a headset or ear buds for the Williams Hearing Assist System are available for pick up at the West Center Box Office one (1) hour prior to performances. A photo ID is required to check out this equipment. An Automated External Defibrillator (AED) is located in the West Center lobby. Please alert GVR staff in the event of an emergency.